Had this last night it was very tasty. 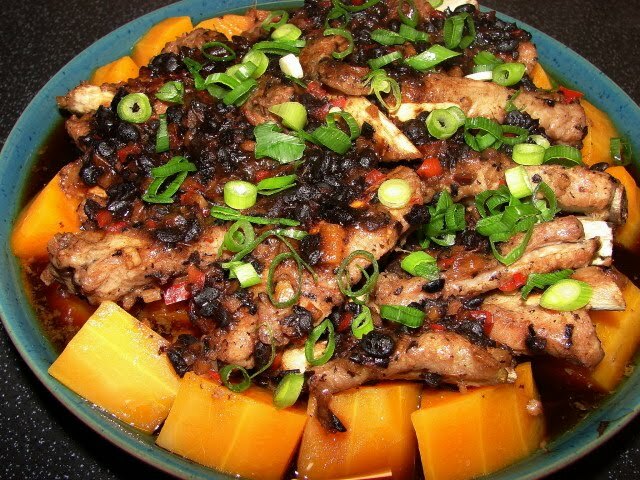 It's steamed pork spare ribs with black bean sauce on a bed of butternut squash. The ribs were tender and juicy coated with lots of black beans mixed with garlic, ginger and chilli. The butternut squash was soft and sweet. A recipe to keep. Here is the recipe to share with you. ** If you want to use black beans sauce in a jar, reduce the qty to about 2 tbsp because most of the Chinese brands black bean sauce is very salty. Heat a small pan or wok. Add in cooking oil, black beans, garlic, ginger, chilli and sugar together. Stir and simmer till the mixture is hot and fragrant, about couple of minutes. Heat off and let this cool a little then stir in soy sauce and slackened cornflour. Mix this black beans mixture with the ribs. If you have time leave to marinate for about 1 hour, the meat will be more flavourful. If you don't have time can go ahead and steam right away. Line a deep dish with buttenut squash chunks. Top with the ribs. Steam at medium heat for about 1 hour or till the ribs are tender. Sprinkle with a some spring onion as garnish. ** You can sub pork ribs with pork belly, beef frying steak or chicken. Steaming time for pork belly and beef will be about the same 1 hour. Chicken will take about 25 - 30 min. If you don't have a large enough steamer. You can cook this in the oven. Add about 1/3 cup of water or stock to provide the steam, then cover the dish with foil and cook in a moderate oven for about the same time. Check after 30 - 35 minutes to ensure the juice is not drying up. I think I would to try this dish in the future. Thanks for sharing. Yes, this dish sounds easy to prepare and yummy, I will definitely try this dish in the future. Thanks. I've been looking for a recipe like this using pork belly and pumpkin/kalabasa with the skin on. I hope this will be the taste I'm looking for. Sounds good!